You are using an old browser that is not supported by DailyGrain. The website will not work as intended and your experience will be affected. DailyGrain supports Internet Explorer version 9 and higher, Chrome, Firefox and Safari. DailyGrain is WA's leading grain price discovery and management provider. More than just an SMS, every day we equip our members, whether they're in the office or paddock, with the right information and tools so their grain marketing decisions can be made with confidence. 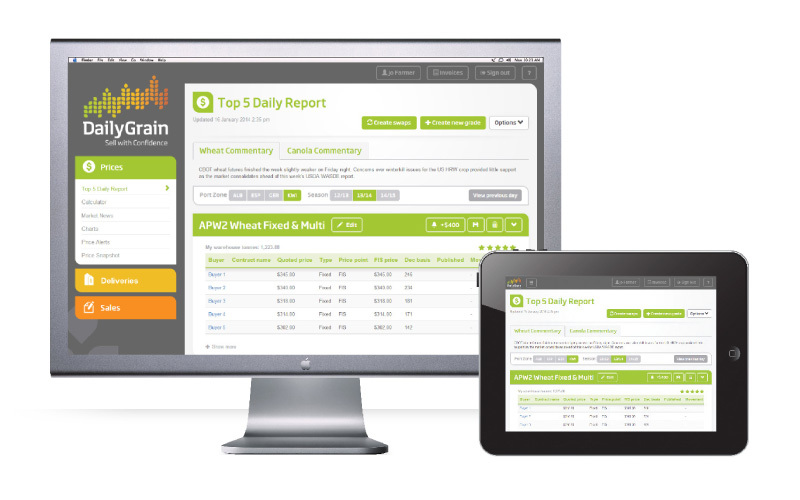 DailyGrain offers two annual grower membership levels, Basic and Premium. Become a member today and enjoy the value, convenience and integration of the leading resource for price discovery services. All things price related from the day's cash and pool prices to historical charts and market news and information. Our open, transparent trading environment that matches sellers with buyers and gives them both a say in price setting. Our link with LoadNet© allows you to chart and view loads as well as contract and nominate. Plan and manage your sales strategy right from production forecasts and sales targets through to contract record keeping.